We've made a playlist of our fave independent/unsigned/'under the radar' acts in 2018. 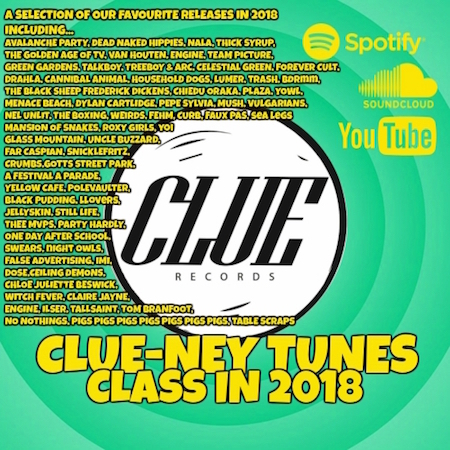 Includes music from Dead Naked Hippies, Avalanche Party, PLAZA, Team Picture, Forever Cult, TRASH, Roxy Girls, Van Houten, The Golden Age Of TV, Household Dogs, Black Pudding Treeboy & Arc, Vulgarians, Pigs Pigs Pigs Pigs Pigs Pigs Pigs, YOWL, SeaLegs, A Festival A Parade, Crumbs, Faux Pas, Still Life, Talkboy, NALA, Dylan Cartlidge, BDRMM, Mansion Of Snakes, Gotts Street Park, Snicklefritz, Yellow Cafe ENGINE, MENACE BEACH, LUMER, Celestial Green, Pepe Sylvia, Nel Unlit, The Boxing, Mush, Weirds, Cannibal Animal, FEHM + more. You can either check them out on Spotify, Soundcloud or YouTube!